The next generation for recycling management. It is the only system of its kind. It is the largest, most diversified line of recycling receptacles offering an extensive selection of sizes, finishes, openings and silk screened messages. RecyclePro Modular Recycling Stations allow you to create your own recycling station with two or more receptacles. When using more than one receptacle you can easily connect the receptacles together to encourage use of the station. 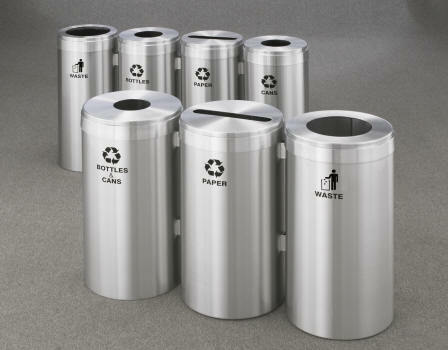 The primary components are the 12”, 15”, and 20” diameter single purpose individual RecyclePro receptacles. The basic distinguishing feature of the receptacles in the Value Modular Series compared to the Glaro Recycle Pro I, II, and III Series, is that the need for an additional inner container has been replaced by using heavy gauge custom sized clear poly bags that are designed to have a snug fit. LB12, LB15, and LB20 poly bags are purchased separately. Poly bags are easily pulled over the top up to a clearly marked guide-line provided on the outside of each receptacle near the top. When the receptacle cover, which has an extra long overlap, is placed on the body, the poly bag is completely concealed and secured in place. When two or more recycling containers are used side by side they may be connected to each other in the sequence you specify. Each catalog number includes all the individual receptacles, hardware and connector brackets you need. For the same cost you may select any type of Glaro opening for the top cover of each unit. Also, at no additional cost you may specify any standard Glaro silk screened message for the front of each recycling unit to indicate the intended use of the unit. All necessary hardware and connector brackets are included and are easily installed. Any number of units may be connected to each other in a straight line. If three units are ordered you may connect them in a triangular or straight line configuration. If you have a preference as to the order in which the different openings are arranged please indicate this or it will be determined at the factory.